This is the sauce we used in the Eggplant & Zucchini alla Parmigiana. Some people would refer to this as a marinara sauce. Other people would call it a tomato sauce. Still others, like me, would simply call it a red sauce. Whatever you call it, it sure is good. You have to forgive me for not posting this sauce as part of the Eggplant & Zucchini Parmigiana post. I simply felt it would have made the post way too lengthy. 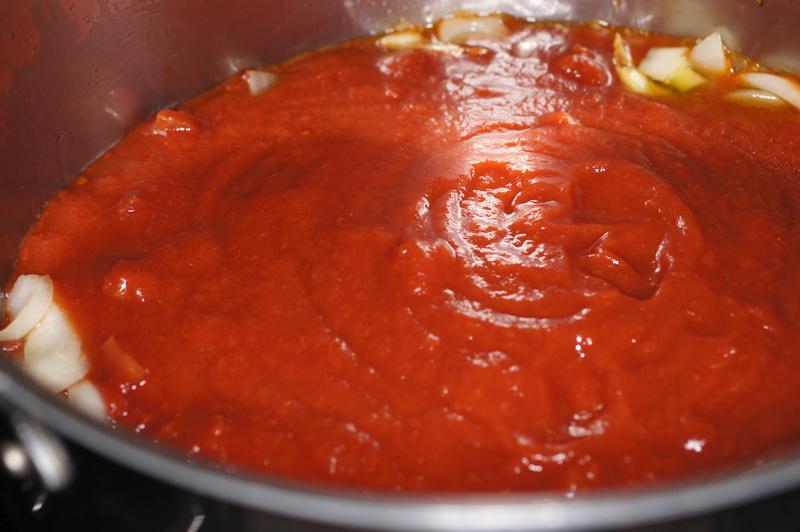 Also, this sauce can be used as the base for many other dishes. Hence, I made an executive decision to make it a stand alone, separate post. So, here it is. Now that I decided to make this a separate post I had two other decisions that had to be made. First, I would have to find time to post it (something I seem to find myself short on lately). Second, and equally important, what would I call it? Would anybody read it if I called it tomato sauce? What if I called it a marinara sauce? Is it really a marinara sauce? How about a sugo rosso or sugo di pomodoro? I could even call it sugo scappato because the meat escaped! The list of questions simply grew and grew which, in turn, compounded my initial problem of finding time to post the recipe. How can you post a recipe if you don’t know what to call it? Regardless what you call this, it’s an excellent tomato sauce that you owe it to yourself to try. If you have never tried a tomato sauce with red wine you are in for a surprise as it provides such a depth of flavor and character. We hope you like it. Add oil to a large pot. Toss in crushed garlic and sauté until it begins to turn a golden brown. Do NOT burn. 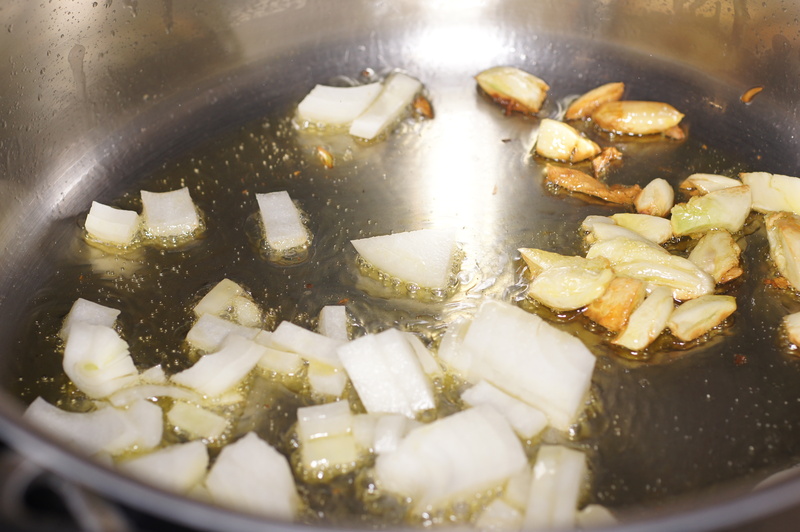 Once it begins to turn a brown color, add onions and sweat until translucent, roughly 2 minutes. Add tomatoes, tomato sauce, water, herbs, pepperoncino flakes and red wine. © 2012 REMCooks.com – Somedays, Baby Lady and I aren’t on the same page. Before I got the opportunity to take the rest of the photos, she had everything together and was cooking merrily along. 😮 Some other day, we will have to do this again so I can get the rest of the photos. Heavy sigh. 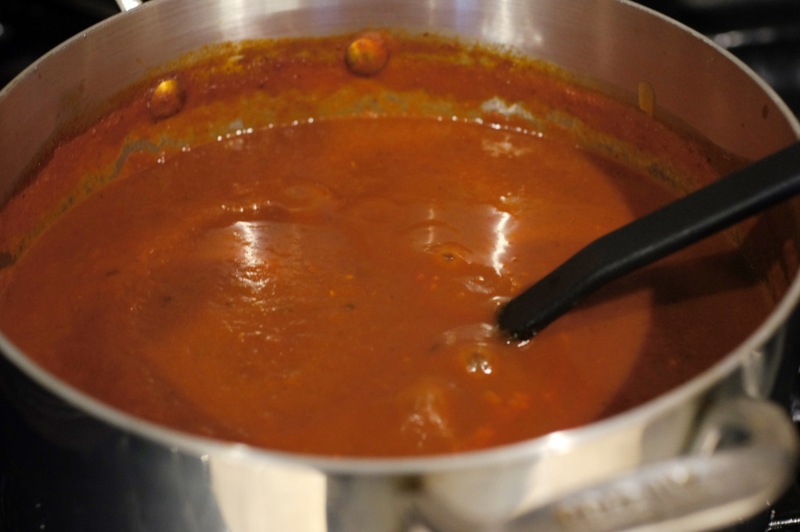 Bring the sauce to a boil, reduce the heat and allow to simmer for roughly 1 hour. Use an immersion blender and puree the sauce. Continue to cook another 30 minutes or so until the sauce has reached its desired thickness. Baby Lady reduced it by roughly 1/3 of its total volume. Once it has reached its desired thickness, season with salt and pepper, to taste. Remove from heat and use. 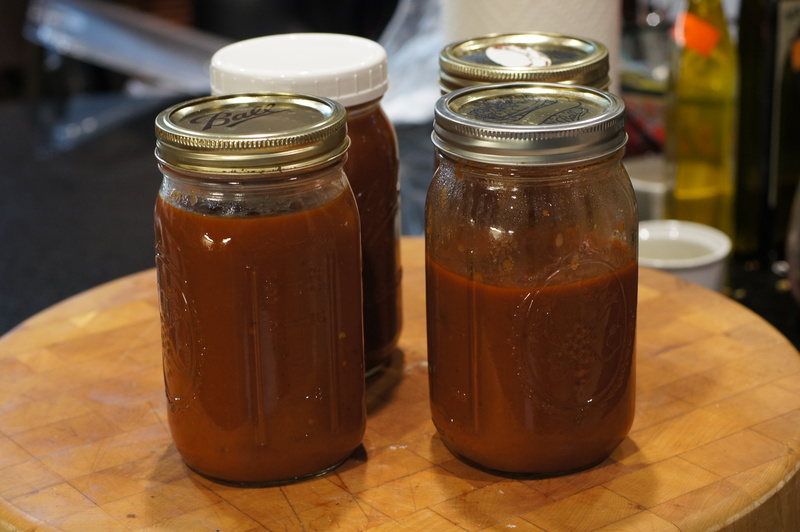 Alternatively, allow the sauce to cool and pour into 1 Qt Mason jars for storage until needed. We like this option because it allows the flavors to meld overnight. NOTES: Some people like their sauce sweeter. If so, add 1 tsp sugar to the sauce toward the end as you adjust the flavors. John, over at The The Bartolini Kitchens, caramelizes the onions and allows the caramelization process to naturally sweeten his sauce. His recipe can be found here. His basic meat sauce can be found here. Love red wine sauces. So many layers to the flavours. Hi, Virginia. Thanks for dropping by and commenting. We love the added layers of flavor the red wine brings to the sauce. It worked beautifully with the eggplant & zucchini alla parmigiana. Lovely stuff Richard. Round these parts, you might be accused of “taking the long way home” in getting into the post. Good of Baby Lady to rescue you in your literary wandering. The first time I read about marinara sauce in the US I was confused because I was expecting something with seafood. In Italy marinara refers to the sea (or a seaman, to be more precise). I like the name though, it’s always good to have a person’s name in a recipe. I like the use of red wine in the recipe, it does indeed add more depth and complexity. Question: how about replacing the tomato sauce and water in the recipe with more canned tomatoes? There are quite some differences between Italian-Italian and American-Italian, and I’m learning new ones all the time. Just today I found out that lasagna in the US is often made with ricotta, rather than with bechamel as in most of Italy (except for the south, where most of the US Italians come from originally). Wow, I can smell that sauce cooking from my apartment! Whatever you want to call…I bet it is delicious. Mmmm. I can smell the aroma just from looking at the picture, Richard. I love rosemary in Italian sauces. I’ll give this a try next batch I make up! Thanks, Peggy. Let us know how you like it. To me, the real difference is the addition of the rosemary and red wine. There is such a nice depth of flavor that develops which is why I don’t consider this a marinara sauce but a red sauce. Regardless, it’s downright tasty. I love the color that red wine gives a which-a-ma-call-it sauce. Once the tomatoes are fully cooked their color combines with the wine to give your sauce that beautiful tint. You know it has to taste delicious. Just look at your sauce in those quarts. Perfection! And, is it the “pickled” kind you purchase in a jar? Hi, Linda. I guess the fault is mine for the confusion. The recipe should read peperoncino flakes, i.e. crushed red pepper flakes. It’s added with the tomato sauce, herbs and red wine. Thanks for bringing this to my attention. Now, I have fixed it. Sorry I was late providing you a response. How did the peperoncini taste in the sauce? Please don’t be sorry! Now I know for the next batch. 🙂 My version had a good tang for sure, but everyone seemed to like at and many added extra sauce onto their dish. I’m looking forward to the extra heat next time. Very fun to make! Thank you!